Chile, Nigeria and – as of this afternoon – England are through to the Pop World Cup semi-finals. One more team will join them – Wichita Lineman’s Iran, who thumped Switzerland in the second round, or Iain Mew’s South Korea, who dispatched the USA. There are no underdogs at this level of Pop Football, with Iran a previous semi-finalist and South Korea widely tipped to go all the way. We expect a tight battle between these two sides. QF4: Iran v South Korea - which do you pick? This match ends on Monday – go below the cut for songs, and a farewell to Ghana. SO FAREWELL THEN…. : Ghana, winners of Group G under Jonathan Bogart and commentary box favourites, whose winning run came to an end against Pop World Champions Nigeria. Ghana went toe-to-toe with the USA across their group games, eventually emerging on top after a dominant performance by Itz Tiffany, whose track we’ll revisit here. Well done Jonathan – and if you enjoyed the Ghanaian playlist, check out the full squad, including substitutes, on YouTube. Iran put forth what very well may be their most potent form of this tactic, glitched out dribbling in the kick velocity leads the opposition to confusion, leaving them a bit in a fog as to how they’ll score. Combine that with long arcing crosses and this bid is far more offensive than any of their offering so far, or anyone gave them credit for before. Those same dribblers work defensively, and even help steal a few times from the guy with the curtain fringe. Not every shot succeeds, but the shot rate is high. Clearly they know they won’t be able to just phase through SK as they did in past rounds without a fight, however. If anyone is ready to be up to Iran’s challenge it’s the first boy band we’ve seen (surprisingly) in the PWC, the fantastic five known as BIG BANG. Once they get out of the Akira thrones and start belting they can cut through Iran’s magic with ease — instrumentally they’re a little whatever, so I can’t say much for their defence, but they’ve got the swag to pierce through on strength alone. The crowd is even into the chant, nice touch. This is up in the air though. Sublime performance from Iran here, ghosting through the opposition defences is right, but this is gorgeous stuff. I wonder if they’ll hold out against a South Korean selection with a big reputation, but the track in question is all aggression and very little charm. For me, at least, the subtle route to goal works. This is another one of those matches that stimulates my pleasure er, thingy. Iran break out some nifty and subtle GsY!BE moves, that continually outwit the SK pretty boys with the ridiculous hair. It’s hard to resist their charm, right up to the point where they use the Psy tactic…twice. Yup, it’s Iran for me. Iran just amazing here – outwitting all-comers in a real Axis of Evil revenge gesture. That’s all. Looking at the comments, I’m surprised at how pro Iran everyone is here — I’m surprised that Iran got this far with a play style like this, as good and finessey as it I find it, but if they’re really about to knock out one of the most powerful pop nations in the world right now, it’ll definitely be a shocker. I know the c.box consensus isn’t an indicator of the voter turnout exactly, but, still. Are South Korea managed by Arsene Wenger? They’re a team with five highly-skilled attacking midfielders, but they lack both a world-class striker and the necessary touches of grit and steel in defence. Iran’s approach throughout this tournament has been unorthodox – they seem to be playing a different game at times – but they nick another winner here, in what is perhaps the biggest upset of PWC 2014. Really having trouble with this one – can’t get the love for the Iranian track at all. I’ve enjoyed most of their play so far, in particular Nariman back in Game 1, but this seems like so much midfield noodling with bits that even sound like AM radio interference – not unlistenable but just not the kind of performance that should win PWC quarter-finals. On the other hand I’ve generally found South Korea overrated (Girls Generation aside which was a feast), but this at least has some attacking verve (do I hear a borrow from “Hung Up” at the start there?) even if the attack is more Stoke City than Holland ’74. A Korean win in a disappointing match, but I seem to be going against the grain again here! BTW I look forward to One Direction adopting this look once they’ve inhaled enough. 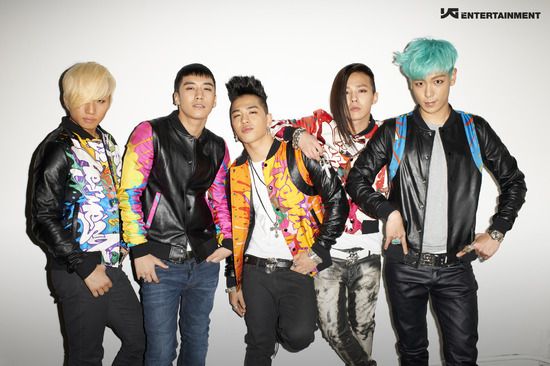 like Big Bang do in this video, pop is over” but the farthest I can go is that it’ll be a nightmare for me. Can’t pick out any flaws in Iran’s defence, but the Korean kit is worthy of a side from USA ’94. Will it distract the ref for long enough to get that crucial handballed goal? Hats off once again to Iran! They’ve done techno technique better than perhaps anyone in this tourney — Ed’s analysis of this game side today was an apt one in my books. England, watch your back end. Congratulations to Iran, who played a beautiful game! I note that going out at the quarter-final stage while being represented by our first boyband of the tournament is a repetition of the fate of Korea in 2010, and future managers may have a lesson to learn there. Based on reception elsewhere (e.g. The Singles Jukebox) I was much more confident in this song than “Yum Yum Yum”, contrary to how the responses turned out. My plan if I got further was to use GLAM’s “I Like That” and 2NE1’s “I am the Best”, which is. Korea had the best visuals of the tournament thus far, but that was never going to be enough. Much as I cheered on Iran this time, I’m hoping for a bit more variety from them in the semis. I’m now discovering too late that Neon Bunny would have been perfect here. That Neon Bunny song is probably my favorite Korean song this year. This is one of the great giant-killing performances of the tournament – so pleased for an Iranian side that have never taken the obvious route.